NASCAR Mailbox: Should Homestead Forever Have the Honor of Hosting the Season Finale? Home / Brandon Hauff / NASCAR Mailbox: Should Homestead Forever Have the Honor of Hosting the Season Finale? Every season since 2002, Homestead-Miami Speedway has hosted championship weekend, providing some of the best racing on the NASCAR circuit. Should Homestead always host the season finale or would it be better to have tracks bid to host the championship? Is there a better track for a championship race, or is it the perfect site for all three NASCAR national series to decide their champion? Meanwhile, with the Championship 4 set for this weekend, there have been several drivers who could be considered a disappointment this season. As we approach 2019, which driver has the best chance of bouncing back? 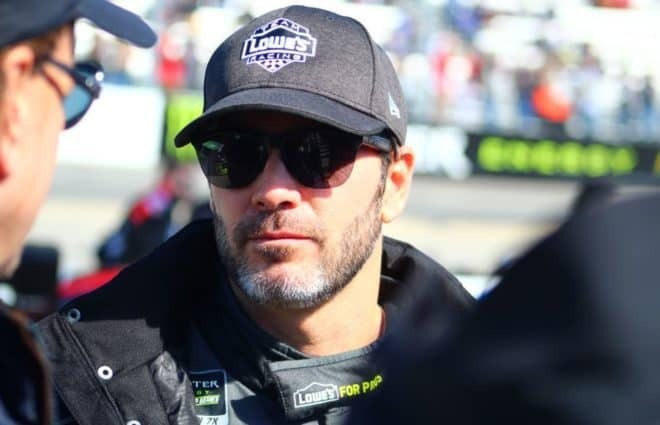 Could it be a past champion in Jimmie Johnson? Or maybe a rising star who had a disappointing season like Bubba Wallace or William Byron? What about somebody else who is due for a breakout season in 2019 with a new team like Matt DiBenedetto or Daniel Suarez, wherever he may end up? A: I have always been happy with Homestead being the season finale for all three series. The track is unique and provides extremely good racing every single season. I have even heard (or seen) people say it deserves two dates throughout the season, but I am fine with its one and only race weekend being the series finales. Regardless of the package, Homestead always seems to be one of the more entertaining Cup races of the season. We see guys like Kyle Larson able to rim ride and run right next to the wall all race long, and then you have guys who like to run the very bottom groove and make it work too. Not only that, but there is usually a middle groove that develops as well, so three distinct grooves make it one of the most exciting tracks NASCAR goes to throughout the year. As much as I would like to see a shakeup in the tracks that make up the 10-race playoffs, my hope is that Homestead will always remain as the finale. This has been the tradition for almost 20 years now and has provided exciting racing through multiple points structures and championship formats. This goes for the XFINITY and Truck series as well. While both series put on a great show each and every week, Homestead provides a compelling end to both seasons as well. We have seen the championship come down to the final restart and race wins come down to last lap moves. It is also a suitable track weather wise based on where the race weekend falls on the schedule, as a majority of the country is experiencing winter weather conditions in mid to late November. Florida, on the other hand, chooses to abstain from the season of winter and typically has warmer temperatures all year long. No matter what happens with the championship battles this weekend, Homestead will provide three excellent races. It just feels right to close out the NASCAR year at Homestead-Miami Speedway. A: There are several candidates for this designation going into next season, and I anticipate there will be many drivers who will have a much better 2019 than they did 2018. However, if I had to pick one driver who will bounce back next season, I would go with Johnson. Next season will be his first without Chad Knaus, who moves over to the No. 24 team with driver William Byron, since joining the Monster Energy NASCAR Cup Series full time in 2002. Johnson will have Kevin Meendering calling the shots for the No. 48 team. To go along with a new crew chief, Ally Financial will be replacing longtime sponsor Lowe’s as the primary sponsor on the car. So many things are changing for Johnson next season and I believe he will feel rejuvenated and ready to make a run at an eighth title. Hendrick Motorsports has found some speed as of late with Chase Elliott and even Alex Bowman having some solid runs, along with Byron scoring a top-10 finish this past weekend at ISM Raceway. That should give the team some confidence going into next season, knowing they can still compete and run strong. There is only one goal for Johnson though and that will be to win that eighth title. Unless he wins this upcoming weekend, it will be the first year in his career that he will go winless throughout the 36-race season. Just because he might in fact not win a single race this year, though, does not mean he will not be a threat next year. You can only hold back a future Hall-of-Fame driver for so long, and Johnson will be ready to pounce next season. I expect him to find Victory Lane once again, and I believe he does have a few good years left in him. He is not done by any means, and he will compete for a title once again. It is way too early to know what will happen, but expect Johnson to go into 2019 very hungry and looking to find the success he has found his entire career. Previous F1 Midweek: Itʻs the Max Verstappen Show! I cannot see NASCAR having it’s Championship weekend in Chicago, New Hampshire or Atlanta for that matter.. If fans don’t go to racing because it is way to hot, they wont when it is way to cold. Also, the season starts and ends at a track owned by ISC, it is about money and lots of it too. The Atlanta Motor Speedway does not have the Championship weekend anymore, it is owned by Bruton Smiith’s Speedway Motor Sports Inc. Why put money for a Championship crowning weekend in someone else’s pocket? Are you saying they make decisions based on money and not what the fans want? I think Brian is in a vault somewhere counting his money. Nascar stopped caring about fans who put their butts in the seats along time ago.